We offer both laser and conventional surgery for soft tissue, spay/neuter, declaw, and orthopedic procedures. Ensuring the health and safety of your pet during surgery is of the utmost importance and requires an anesthetic and monitoring regimen that adheres to the highest principles and ideals of veterinary medicine. All pets undergoing surgery receive state-of-the-are anesthetic administration and cardiovascular monitoring. Prior to surgery, your pet will be examined and a presurgical blood screen will be performed. The results of these tests and your pet's past anesthetic history, breed, pre-existing conditions, and age will be used to create an individualized anesthesia protocol for your pet. Intravenous catheters are placed in your pet's arm or leg for longer surgical procedures and for all high-risk and older patients. Catheters allow for intravenous fluids and administration of medication during your pet's surgery and recovery. During your pet's surgical procedure, he/she will be monitored using a pulse oximeter, heart monitor, blood pressure monitor, and ECG. This allows us to maintain the highest level of safety for your pet before, during, and after their procedure. Warm water circulation pads are used to keep your pet warm during surgery and recovery. We have a centrally placed ICU for pets that are recovering from surgery so they can be closely monitored. For comfort and convenience, Rocky Mountain Small Animal Hospital is equipped with separate feline and canine recovery and hospital wards. Blankets and pads are given to all patients to make their recovery more comfortable and to keep them warm. Gastropexy surgery, and many others. We refer thoracic/chest surgery to a specialty practice near our hospital. Through a Board Certified Veterinary Surgeon many other procedures are available on request. Dr. Tancher and Dr. Bean are trained and certified on our surgical laser. 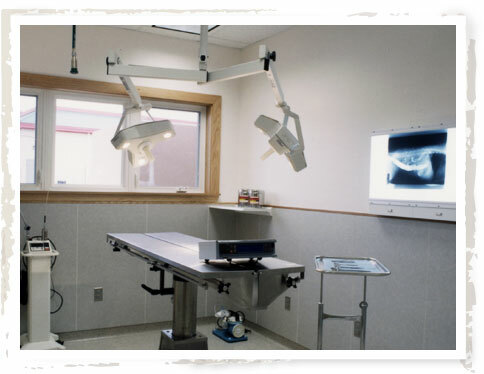 We have had a surgical laser at Rocky Mountain for the past 14 years. Lasers provide a fundamentally different approach to surgery. With laser surgery, a highly focused light beam can efficiently vaporize or chip away the tissue we wish to remove. At the same time, it seals capillaries, small blood vessels, lymphatics, and nerve endings. This drastically reduces bleeding, and also minimizes edema and pain. We can perform a number of surgical procedures that are not practical with a conventional scalpel, and the patient experiences a far more comfortable – and fast – post-operative recovery. Laser beams also have the added benefit of efficiently killing the bacteria in their path, producing a sterilizing effect in the surgical field. Paim management is of great importance in modern veterinary medicine. We have numerous pain management options for our surgical and medical patients. We use injectable and oral medication alone and in combinations for the safest and most effective pain management protocols.